For courses that investigate race, class, and gender issues in Criminal Justice. 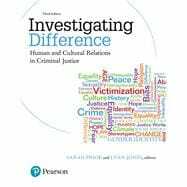 Investigating Difference examines the full range of individual differences across the entire criminal justice system. With a focus on positive solutions, the Third Edition moves beyond a prioritization of race to emphasize the multitude of social identity categories that matter in the justice system. Written by esteemed faculty and leading scholars in the field, this edition includes new chapters on intersectionality, specialty courts, and whiteness; newly authored and conceptualized chapters on gender, sexual orientation and gender identity, victimization, African Americans, Asian Americans, immigration, disability, and religion; a look at globalization and its impact on victims, offenders, and practitioners; and updated statistics and policy information throughout.